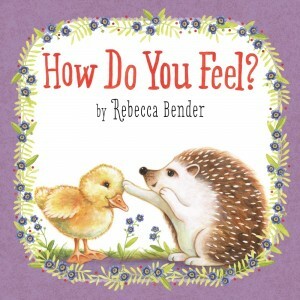 “A little hedgehog sets off on a voyage of sensory discovery in the picture book, How Do You Feel?, by Rebecca Bender…. Through an elegant simplicity, the author is able to use richer language, which becomes accessible to even the youngest of readers. “Little ones often have difficulty differentiating between feeling, the emotion, and feeling, the sense of touch, and Rebecca Bender, creator of the award-winning Giraffe and Bird books…has some fun word play with that to compare textures of a variety of animals…. Pajama Press has started putting out these lovely padded-cover books for preschoolers that are so much more inviting to hold than ordinary board books. With its soft, cushioned cover, the parade of animals within and the repetitive text, How Do You Feel? will become a popular read-aloud book for parents and teachers of preschoolers and kindergarteners. The rhythm and predictability of the text offers great opportunities for little ones to suggest answers to each question. It’s a great teaching tool. I can just imagine parents and teachers asking, just as they often play that game asking what a dog or cat says, how a snake or a kitten feels. What did you like about the book? This book is about an adorable hedgehog who asks animals how they feel. The answers speak to their physical nature. A duckling feels fuzzy like tall grass reaching for the sun. Each animal responds with an answer that also includes a simile. The cute ending is when the animals ask the hedgehog how he feels, and only negative adjectives come to mind. Finally they all tickle him and he says he feels happy. Anything you didn’t like about it? I love everything about this book. To Whom Would You Recommend this book? This is great for very young children and especially good for students learning English. There are lots of new adjectives and similes that students will enjoy learning.